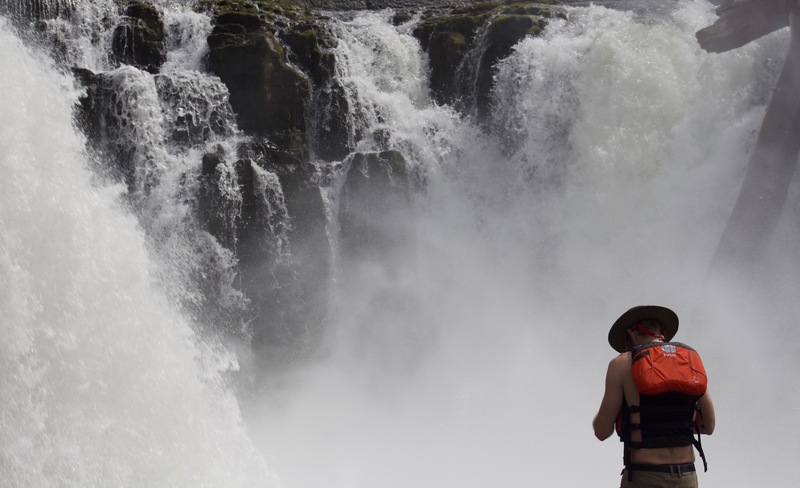 Oregonians love their waterfalls, but not many know that fewer than 20 miles from Portland lies Oregon’s largest waterfall: Willamette Falls. Standing four stories high with a flow of over 30,000 cubic feet of water per second, it is the second largest waterfall in the United States by volume–only Niagara Falls is bigger. Blocked from view by old industrial buildings that make it almost invisible from the road, the best way to see it is from The Willamette River. When I moved to Oregon, a friend of mine mentioned Willamette Falls and the relative ease of getting there. Having spent much of my life on the water, and having worked as a kayak guide in Alaska and British Columbia, I had to check it out. I made the short 20-minute drive down I-205 to Oregon City. I met up with Jon Haynie, a former kayak guide I met while working in Alaska who has led tours of the falls and would be my companion on this adventure. We met up at eNRG Kayaking, an outfitter whose floating shop is located on a dock about a mile and a half downstream from the waterfall. Getting a boat was quick and easy, and for $25 each, we were geared up with a kayak, paddle, and life jacket. Jon and I put our kayaks in the water and set off. We paddled past rows of sleeping sea lions, their thick bodies stacked up along the dock, and out into the river. The water beyond the dock was filled with boats anchored against the slow moving current, with fishing lines cast to catch the running salmon. From here, the falls were hidden from view, blocked by buildings and the curve of the river. Ahead, the Oregon City Bridge spanned the river as a giant concrete structure topped by a large arch. Crossing under the bridge, our paddles cut through the water and took us away from the fisherman, under the bridge and into a different world. Derelict buildings rose from the banks of the river, including the remnants of the West Lin and Blue Heron Paper companies and Portland General Electric hydro-electric generators. The Willamette Falls Legacy Project, a partnership between Oregon City, Clackamas County, and the State of Oregon, plans to redevelop the site, but for now the buildings lay dormant. Gulls and herons soared out of the buildings’ lifeless windows, and on the water, sea lions tossed the ripped carcasses of salmon into the air, feasting on chunks torn from the fish. We rounded the curve of the river and the falls came into view. The abandoned buildings did little to tarnish the majesty of the 40-foot-tall Willamette Falls. I paddled toward its 1500-foot-wide base, trying to get as close as possible, water churning around the kayak. The sound of the water falling over the cliffs drowned out all other noise. When I was about 100 feet from the base of the falls, a sea lion breached next to me. I could have reached out and touched it, its massive body almost the same size as my little boat. On the left side of the falls, the rocks form a small cove, just big enough for our two kayaks. We stopped and climbed onto the rocks, pulling our boats up behind us. We stood at the base of the cataract and watched the water fall into the river. I walked towards it. Hugging the cliff wall, I inched my way underneath the cascade. I stood between the cascade and the cliff wall, the water arcing over me into the river. The cold spray felt refreshing in the hot sun. I climbed back down the rocks to the water and got back into my kayak. Taking one last look at the falls, Jon and I pointed our boats downstream and let the current take us back under the bridge, beyond the long dead buildings. Previous Watch the Trailer for And And And’s Upcoming Short Film.